How to perform a deployment or an environment migration in OBIEE ? In Progress. It's actually much more a collection of link. The agent, job that are dependent must be listed because they may miss their start date. OBIEE 10g: Formatting not Copied when You Copy the Catalog There is no catalog migration of the system formats. The Built-in system wide default formats are not copied during catalog migration as they are not exposed via the Catalog Manager. In general these defaults are saved internally in the Web Catalog, but not exposed in the Catalog Manager. 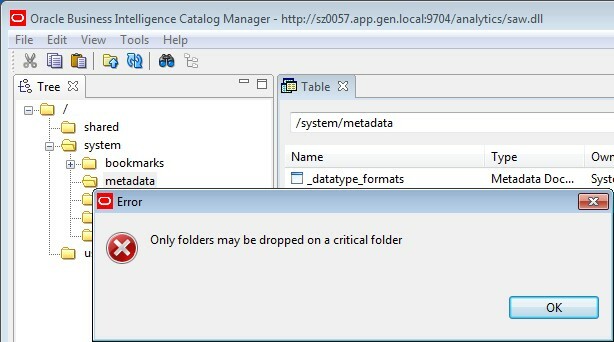 copy the folder /system/metadata from source to destination via the Catalog Manager. first take the ownership of the metadata folder and of all files. of copy the contents under web\catalog\<SubjectAreaName>\root\system\metadata from the source Catalog to the target catalog. The file root > system > metadata > _datatype_formats contains the system wide default for data type. How to Automate the BI Catalog Migration?